How Fast Does Opened Protein Powder Lose Potency? While you may have heard that protein powder can lose its potency after it's opened, that is not true. Protein powder is just as effective after you open it as it was when you purchased it. However, protein powder may spoil if it is not stored properly or used before the expiration date. Protein powder is designed to last, with many brands staying fresh for up to two years past the manufacturing date. 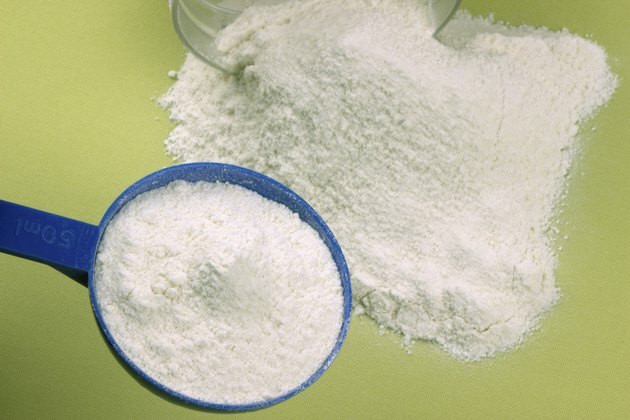 Any protein powder you buy will be labeled with an expiration or best if used by date. Using your protein powder after its expiration date is akin to drinking milk after it has expired. If your powder has expired, it is best to throw it away. Most protein powders are made from animal by-products, such as eggs and dairy. Because these ingredients are processed and dried they do not have to be refrigerated but they do need to be stored properly. The best place to store your protein powder is in a cool, dry place, such as a cupboard or pantry. Some people like to mix their protein shakes ahead of time. Doing this will not effect the potency of the powder, but it will cause it to spoil faster. If you pre-mix your protein shakes, you must keep them refrigerated until you're ready to drink them. Never mix more than a day's worth of shakes ahead of time because they won't remain fresh. Many protein powders have added vitamins and minerals that may lose their potency once the powder has expired. This can be a problem if you're relying on the powder for your daily needs. However, since you shouldn't be using any protein powder that has expired, this should be a moot point.